Lubrication professionals often become very familiar with the base oil viscosity of their lubricants. After all, viscosity is the most important property of a base oil. Baselines for incoming oils are set and the health of the lubricant is monitored based on viscosity alone. However, there is more to lubricants than just viscosity. It’s crucial to understand the role of additives and their function(s) within the lubricant. Lubricant additives are organic or inorganic compounds dissolved or suspended as solids in oil. They typically range between 0.1 to 30 percent of the oil volume, depending on the machine. Additive polarity is defined as the natural directional attraction of additive molecules to other polar materials in contact with oil. In simple terms, it is anything that water dissolves or dissolves into water. A sponge, a metal surface, dirt, water and wood pulp are all polar. Things that are not polar include wax, Teflon, mineral base stock, a duck’s back and water repellents. that are around you daily. If you are allowing into your system contaminants that additives are attracted to, such as dirt, silica and water, the additives will cling to the contaminants and settle to the bottom or will be filtered out and deplete your additive package. There are a few polar mechanisms such as particle enveloping, water emulsifying and metal wetting that are worthy of discussion. Particle enveloping means that the additive will cling to the particle surface and envelop it. These additives are metal deactivators, detergents and dispersants. They are used to peptize (disperse) soot particles for the purpose of preventing agglomeration, settling and deposits, especially at low to moderate temperatures. You generally will see this in an engine. It offers a good reason to repair and eliminate any issues as soon as they are detected through an appropriate oil analysis test slate. When using oil additives, more is not always better. As more additive is blended into the oil, sometimes there isn’t any more benefit gained, and at times the performance actually deteriorates. In other cases, the performance of the additive doesn’t improve, but the duration of service does improve. In addition, increasing the percentage of a certain additive may improve one property of an oil while at the same time degrade another. When the specified concentrations of additives become unbalanced, overall oil quality can also be affected. Some additives compete with each other for the same space on a metal surface. If a high concentration of an anti-wear agent is added to the oil, the corrosion inhibitor may become less effective. The result may be an increase in corrosion-related problems. Water emulsifying occurs when the additive polar head clings to a micro-droplet of moisture. These types of additives are emulsifying agents. Consider this the next time you observe water in a reservoir. While it is important to remove the water, determine where the water entered the system and repair it using a root-cause maintenance approach, you must also keep in mind that the additive package has been affected. In lubrication terms, this is known as additive depletion. A proper oil analysis report can determine the health of the additives remaining in the lubricant. Metal wetting is when additives anchor to metal surfaces, which is what they are supposed to do. They attach to the interior of the gear casing, gear teeth, bearings, shafts, etc. Additives that perform this function are rust inhibitors, anti-wear (AW) and EP additives, oiliness agents and corrosion inhibitors. AW additives work specifically to protect metal surfaces during boundary conditions. They form a ductile, ash-like film at moderate to high contact temperatures (150 to 230 degrees F). Under boundary conditions, AW film shears instead of surface material. One common anti-wear additive is zinc dialkyldithiophosphate (ZDDP). It reduces the risk of metal-to-metal contact, which can lead to increased heat, result in oxidation and negatively affect the film strength. 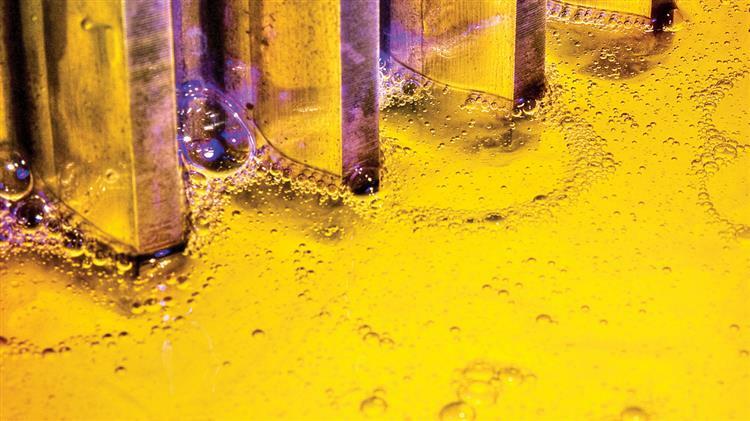 Whether they are enhancing, suppressing or imparting new properties to the base oil, additives play an important role in the lubrication of machinery. Remember, when the additives are gone, they’re gone, so don’t forget to check your additive package. There are many types of chemical additives mixed into base oils to enhance the properties of the base oil, to suppress some undesirable properties of the base oil and possibly to impart some new properties. Additives typically make up about 0.1 to 30 percent of the finished lubricating oil, depending upon the target application of the lubricant. Lubricant additives are expensive chemicals, and creating the proper mix or formulation of additives is a very complicated science. It is the choice of additives that differentiates a turbine (R&O) oil from a hydraulic oil, a gear oil and an engine oil. Many lubricant additives are available, and they are selected for use based upon their ability to perform their intended function. They are also chosen for their ability to mix easily with the selected base oils, to be compatible with other additives in the formulation and to be cost effective. Some additives perform their function within the body of the oil (e.g., anti-oxidants), while others do their work on the surface of the metal (e.g., anti-wear additives and rust inhibitors). Oxidation is the general attack of the weakest components of the base oil by oxygen in the air. It occurs at all temperatures all of the time but is accelerated at higher temperatures and by the presence of water, wear metals and other contaminants. It ultimately causes acids (which produce corrosion) and sludge (which results in surface deposits and viscosity to increase) to form. Oxidation inhibitors, as they are also called, are used to extend the operating life of the oil. They are sacrificial additives that are consumed while performing their duty of delaying the onset of oxidation, thus protecting the base oil. They are present in almost every lubricating oil and grease. These additives reduce or eliminate internal rust and corrosion by neutralizing acids and forming a chemical protective barrier to repel moisture from metal surfaces. Some of these inhibitors are specific to protecting certain metals. Therefore, an oil may contain several corrosion inhibitors. Again, they are common in almost every oil and grease. Metal deactivators are another form of corrosion inhibitor. Viscosity index improvers are very large polymer additives that partially prevent the oil from thinning out (losing viscosity) as the temperature increases. These additives are used extensively when blending multi-grade engine oils such as SAE 5W-30 or SAE 15W-40. They are also responsible for better oil flow at low temperatures, resulting in reduction in wear and improved fuel economy. In addition, VI improvers are used to achieve high-VI hydraulic and gear oils for improved start-up and lubrication at low temperatures. To visualize how a VI-improver additive functions, think of the VI improver as an octopus or coil spring that stays coiled up in a ball at low temperatures and has very little effect on the oil viscosity. Then, as the temperature rises, the additive (or octopus) expands or extends its arms (making it larger) and prevents the oil from thinning out too much at high temperatures. VI improvers do have a couple of negative features. The additives are large (high molecular weight) polymers, which makes them susceptible to being chopped or cut up into small pieces by machine components (shearing forces). Gears are notoriously hard on VI-improver additives. Permanent shearing of the VI-improver additive can cause significant viscosity losses, which can be detected with oil analysis. A second form of viscosity loss occurs due to high shearing forces in the load zone of frictional surfaces (e.g., in journal bearings). It is thought that the VI-improver additive loses its shape or uniform orientation and therefore loses some of its thickening ability. The viscosity of the oil temporarily drops within the load zone and then rebounds to its normal viscosity after it leaves the load zone. This characteristic actually aids in the reduction of fuel consumption. There are several different types of VI improvers (olefin copolymers are common). High-quality VI improvers are less susceptible to permanent shear loss than low-cost, low-quality VI improvers. These additives are typically used to protect machine parts from wear and loss of metal during boundary lubrication conditions. 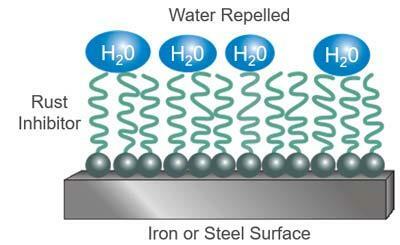 They are polar additives that attach to frictional metal surfaces. They react chemically with the metal surfaces when metal-to-metal contact occurs in conditions of mixed and boundary lubrication. They are activated by the heat of contact to form a film that minimizes wear. They also help protect the base oil from oxidation and the metal from damage by corrosive acids. These additives become “used up” by performing their function, after which adhesive wear damage will increase. They are typically phosphorus compounds, with the most common being zinc dialkyldithiophosphate (ZDDP). There are different versions of ZDDP — some intended for hydraulic applications and others for the higher temperatures encountered in engine oils. ZDDP also has some anti-oxidant and corrosion-inhibition properties. In addition, other types of phosphorous-based chemicals are used for anti-wear protection (e.g., TCP). These additives are more chemically aggressive than AW additives. They react chemically with metal (iron) surfaces to form a sacrificial surface film that prevents the welding and seizure of opposing asperities caused by metal-to-metal contact (adhesive wear). They are activated at high loads and by the high contact temperatures that are created. They are typically used in gear oils and give those oils that unique, strong sulphur smell. These additives usually contain sulphur and phosphorus compounds (and occasionally boron compounds). They can be corrosive toward yellow metals, especially at higher temperatures, and therefore should not be used in worm gear and similar applications where copper-based metals are used. Some chlorine-based EP additives exist but are rarely used due to corrosion concerns. Anti-wear additives and extreme pressure agents form a large group of chemical additives that carry out their function of protecting metal surfaces during boundary lubrication by forming a protective film or barrier on the wear surfaces. As long as the hydrodynamic or elastohydrodynamic oil film is maintained between the metal surfaces, boundary lubrication will not occur and these boundary lubrication additives will not be required to perform their function. When the oil film does break down and asperity contact is made under high loads or high temperatures, these boundary lubrication additives protect the wearing surfaces. Detergents perform two functions. They help to keep hot metal components free of deposits (clean) and neutralize acids that form in the oil. Detergents are primarily used in engine oils and are alkaline or basic in nature. They form the basis of the reserve alkalinity of engine oils, which is referred to as the base number (BN). They are typically materials of calcium and magnesium chemistry. Barium-based detergents were used in the past but are rarely used now. Since these metal compounds leave an ash deposit when the oil is burned, they may cause unwanted residue to form in high-temperature applications. Due to this ash concern, many OEMs are specifying low-ash oils for equipment operating at high temperatures. A detergent additive is normally used in conjunction with a dispersant additive. Dispersants are mainly found in engine oil with detergents to help keep engines clean and free of deposits. 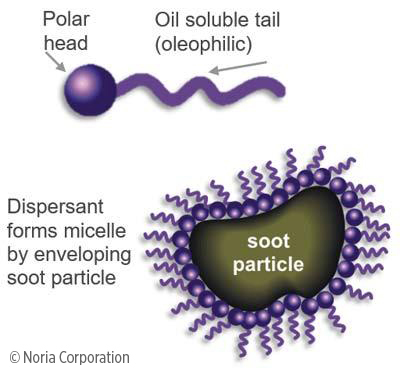 The main function of dispersants is to keep particles of diesel engine soot finely dispersed or suspended in the oil (less than 1 micron in size). The objective is to keep the contaminant suspended and not allow it to agglomerate in the oil so that it will minimize damage and can be carried out of the engine during an oil change. Dispersants are generally organic and ashless. As such, they are not easily detectable with conventional oil analysis. The combination of detergent/dispersant additives allows more acid compounds to be neutralized and more contaminant particles to stay suspended. As these additives perform their functions of neutralizing acids and suspending contaminants, they will eventually exceed their capacity, which will necessitate an oil change. The chemicals in this additive group possess low interfacial tension, which weakens the oil bubble wall and allows the foam bubbles to burst more readily. They have an indirect effect on oxidation by reducing the amount of air-oil contact. Some of these additives are oil-insoluble silicone materials that are not dissolved but rather dispersed finely in the lubricating oil. Very low concentrations are usually required. If too much anti-foaming additive is added, it can have a reverse effect and promote further foaming and air entrainment. Friction modifiers are typically used in engine oils and automatic transmission fluids to alter the friction between engine and transmission components. In engines, the emphasis is on lowering friction to improve fuel economy. In transmissions, the focus is on improving the engagement of the clutch materials. Friction modifiers can be thought of as anti-wear additives for lower loads that are not activated by contact temperatures. The pour point of an oil is approximately the lowest temperature at which an oil will remain fluid. Wax crystals that form in paraffinic mineral oils crystallize (become solid) at low temperatures. The solid crystals form a lattice network that inhibits the remaining liquid oil from flowing. The additives in this group reduce the size of the wax crystals in the oil and their interaction with each other, allowing the oil to continue to flow at low temperatures. Demulsifier additives prevent the formation of a stable oil-water mixture or an emulsion by changing the interfacial tension of the oil so that water will coalesce and separate more readily from the oil. This is an important characteristic for lubricants exposed to steam or water so that free water can settle out and be easily drained off at a reservoir. Emulsifiers are used in oil-water-based metal-working fluids and fire-resistant fluids to help create a stable oil-water emulsion. The emulsifier additive can be thought of as a glue binding the oil and water together, because normally they would like to separate from each other due to interfacial tension and differences in specific gravity. Biocides are often added to water-based lubricants to control the growth of bacteria. Tackifiers are stringy materials used in some oils and greases to prevent the lubricant from flinging off the metal surface during rotational movement. 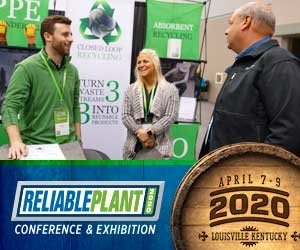 To be acceptable to blenders and end users alike, the additives must be capable of being handled in conventional blending equipment, stable in storage, free of offensive odor and be non‑toxic by normal industrial standards. Since many are highly viscous materials, they are generally sold to the oil formulator as concentrated solutions in a base oil carrier. More additive is not always better. The old saying, “If a little bit of something is good, then more of the same is better,” is not necessarily true when using oil additives. As more additive is blended into the oil, sometimes there isn’t any more benefit gained, and at times the performance actually deteriorates. In other cases, the performance of the additive doesn’t improve, but the duration of service does improve. Increasing the percentage of a certain additive may improve one property of an oil while at the same time degrade another. When the specified concentrations of additives become unbalanced, overall oil quality can be affected. “separation” due to settling or filtration. The adsorption and separation mechanisms involve mass transfer or physical movement of the additive. For many additives, the longer the oil remains in service, the less effective the remaining additive package is in protecting the equipment. When the additive package weakens, viscosity increases, sludge begins to form, corrosive acids start to attack bearings and metal surfaces, and/or wear begins to increase. If oils of low quality are used, the point at which these problems begin will occur much sooner. It is for these reasons that top-quality lubricants meeting the correct industry specifications (e.g., API engine service classifications) should always be selected. The following table can be used as a guide for a more thorough understanding of additive types and their functions in engine oil formulations. It is evident from the information above that there is a lot of chemistry occurring in most of the oils that are used to lubricate equipment. They are complicated mixtures of chemicals that are in balance with one another and need to be respected. It is for those reasons that the mixing of different oils and adding additional lubricant additives should be avoided. There are hundreds of chemical additives and supplemental lubricant conditioners available. 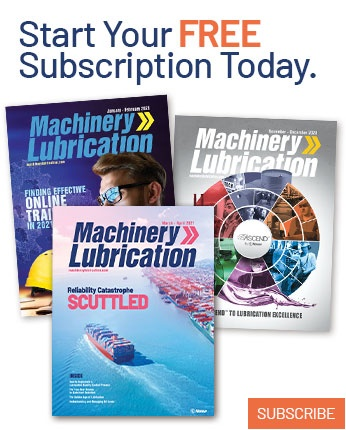 In certain specialized applications or industries, these additives may have a place in the improvement of lubrication. However, some manufacturers of supplemental lubricants will make claims about their products that are exaggerated and/or unproven, or they fail to mention a negative side effect that the additive may cause. Take great care in the selection and application of these products, or better still, avoid using them. If you want a better oil, buy a better oil in the first place and leave the chemistry to the people who know what they are doing. Often oil and equipment warranties are voided with the use of after-market additives because the final formulation has never been tested and approved. Buyer beware. An inferior lubricant cannot be converted into a premium product simply by the inclusion of an additive. Purchasing a poor-quality finished oil and attempting to overcome its poor lubricating qualities with some special additive is illogical. Some laboratory tests can be tricked into providing a positive result. Some additives can trick a given test into providing a passing result. Often multiple oxidation and wear tests are run to obtain a better indication of the performance of an additive. Then actual field trials are performed. Base oils can only dissolve (carry) a certain amount of additive. As a result, the addition of a supplemental additive into an oil having a low level of solubility or being already saturated with additive may simply mean that the additive will settle out of the solution and remain in the bottom of the crankcase or sump. The additive may never carry out its claimed or intended function. 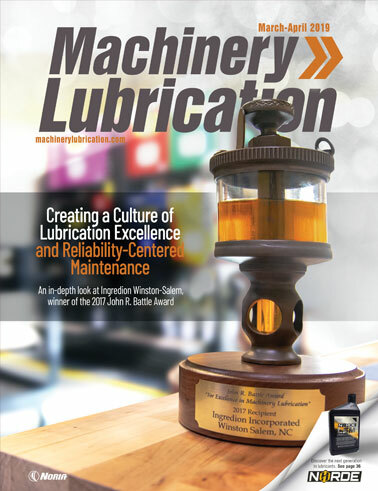 Determine whether an actual lubrication problem exists. For instance, an oil contamination problem is most often related to poor maintenance or inadequate filtration and not necessarily poor lubrication or poor-quality oil. Choose the right supplemental additive or oil conditioner. This means taking the time to research the makeup and compatibility of the various products on the market. Insist that factual field-test data is made available that substantiates the claims made regarding the product’s effectiveness. Consult a reputable, independent oil analysis laboratory. Have the existing oil analyzed at least twice before adding a supplemental additive. This will establish a reference point. After the addition of the special additive or conditioner, continue to have the oil analyzed on a regular basis. Only through this method of comparison can objective data regarding the effectiveness of the additive be obtained. There is a great deal of controversy surrounding the application of supplemental additives. However, it is true that certain supplemental lubricant additives will reduce or eliminate friction in some applications such as machine tool ways, extreme pressure gear drives and certain high-pressure hydraulic system applications.